You may have noticed something new today. I’ve added a Japan Soc plugin which inserts a badge next to posts. I only heard about this site yesterday, but it looks pretty cool, kind of like Digg for Japanese things. If things go well with this post, other social bookmarking links should show up at the bottom as well. I’ve been noticing quite a bit of these sites linking to me lately, so I thought I’d try to make it easier for people to add it in. The animal exodus continues today with two little bears. They are not sitting in chairs. (Moms will know what I’m talking about.) They were late for the 300 bento because their hybernation alarm clock ran out of batteries during the winter. They woke up just a little too late to get in on Noah’s Bento. 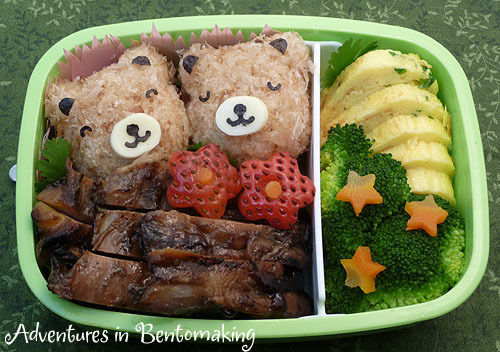 Mr. Bear (right) is still a little sleepy, while Mrs. Bear (left) is just happy to be in her own special bento with her honey. 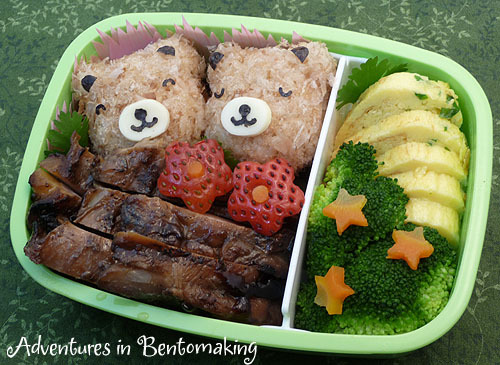 These bears are inspired by bears I saw in my Japanese bento book. The rice is colored brown with shoyu and then covered with katsuo bushi to make them “furry.” I’m giving them to my co-worker, who shrieked at the sight of them in the book. I will eat my lunch with onigiri still leftover from 300. Someone commented on LJ asking me how I manage to keep my onigiri from being nasty after an extended fridge stay. I wrapped them in saran wrap and put them in a ziploc container. When I took these guys out, they were pretty hard, so I just warmed them up for about 15 seconds with a damp paper towel covering them. If you were going to eat them, I’d have said put more water in the towel and microwave them longer, but I just wanted them sticky so that I could add the katsuo bushi which is also called dried bonito flakes. For the face, I used a nori punch that I just got in today. I bought it on eBay and fortunately there are still some for sale, so grab one! A few years ago, I’d have looked at this face and thought, “Ech. How utterly first grade teacher.” But now, with my keen bento instincts, I am able to see that when spread out and used in pieces, this face is actually fantastic for bentists! I didn’t use the mouth this time, but I can assure you I will soon. The eyes came out so well! I punched through a folded nori sheet and it came out nice and crisp. The nori I used today was a little on the stale side, but that turned out to be a good thing. For the ears I just hand cut a little shape, using a “micro scissors” that I found at the Hobby Company. There are nice Micro-Tip Scissors on Amazon, but since the Hobby Company one was only $1.99, I went with that. The nose and mouth are from my Hello Kitty onigiri set from J-List. The white nose area was cut out of white cheese. Thankfully, these guys don’t look like alien eyes like my last teddy bear bento did. I’ve got to come up with a catchy name for these little tutorial pictures. I’ve tagged them as tutorials and walkthroughs, but those don’t sound very catchy. Bento Steps? 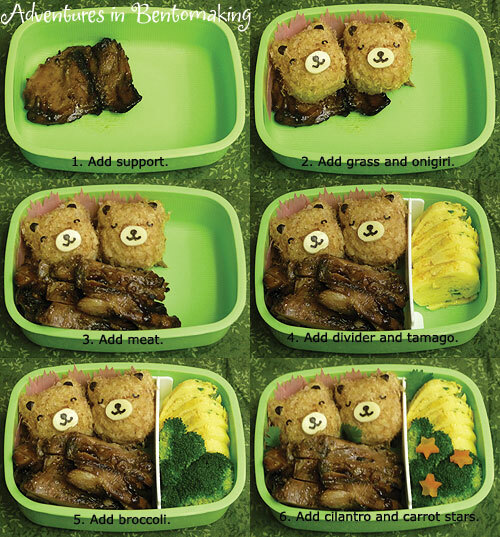 Step-by-Step Bento? I’m open to suggestions. Today’s bento was done very similarly to yesterday’s. My in-laws decided to order food from Kim Chee 7 last night, so we had lots of Korean leftovers last night. I took two pieces of bbq chicken, one small and one regular. The small one was pretty flat, so I added that in step one as support for the bears. In step two, I add two pieces of pink sushi grass and the teddy bear onigiri. I cut the bbq chicken into slices and layered them nicely in the box below the bears. In step four, I added a food divider and five slices of tamagoyaki. There is a fat end piece holding up the back slice. In step 5 I added two pieces of broccoli on top of the egg. In step six, I add little cilantro leaves in three places to hide empty spots and put three little carrot stars onto the broccoli. Finally, I added two strawberry flowers. They are cut with vegetable cutters and then the middle is made out of carrot. I used a mini cutter for the center, but you can use a small straw instead. When making my bentos one of the things I try to focus on the most is color balance. Choosing the box can assist when you have mostly same colored food and egg and broccoli really brighten things up. I always have umeboshi on hand in case I don’t have any other red things on hand. Just so people keep an eye out, I am looking to launch a new contest soon, hopefully tomorrow since we are having an office potluck. Come back to check out the details!